If the net operating income (NOI) from the property plus its liquid accounts1 is greater than the debt installment due, then the borrower will exercise Option 1 and make the debt service payment2. If the NOI plus accounts are less than the installment, the borrower would have to use funds from other sources to make the payment. In those circumstances the borrower must be both willing and able to pay those additional funds. Let us first look at the borrower's willingness to pay. The term can be characterized as the expected shortfall in NOI relative to the debt service required. 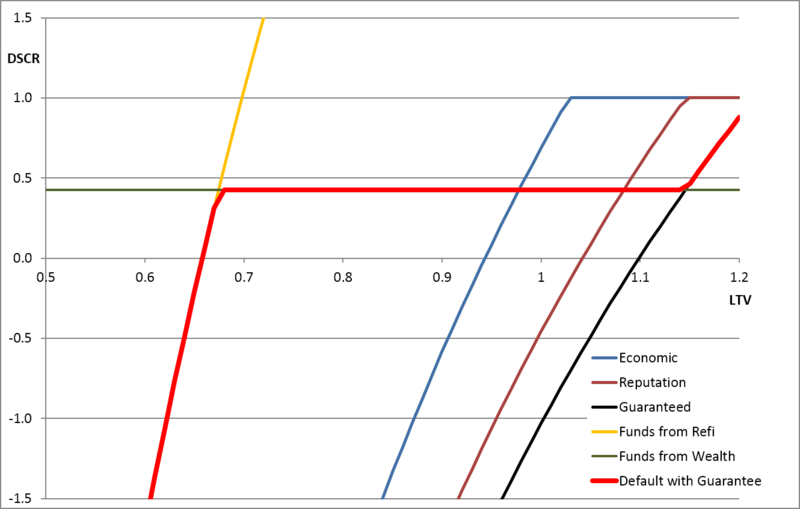 The expected shortfall is a complex function of expected future lease income and operating costs. 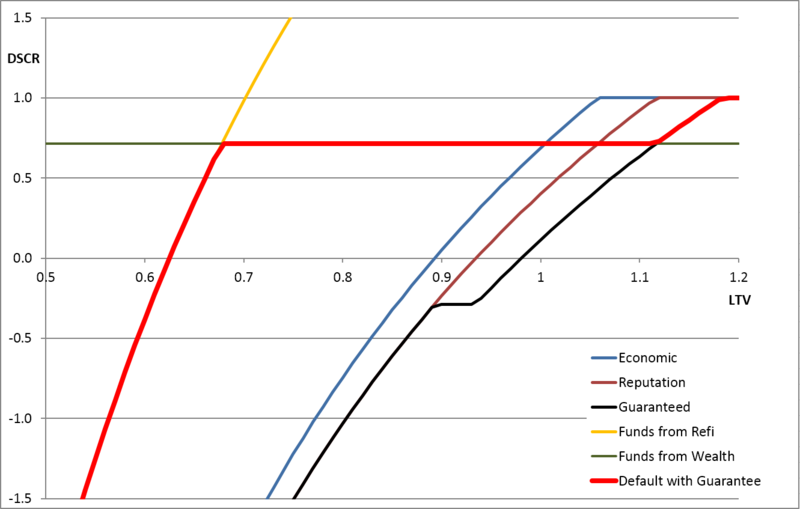 When using an approach such as cashflow simulation the expected shortfall can be evaluated directly, but for more simple approaches and for illustration in this paper, the expected shortfall can be recast in terms of the average DSCR over the decision horizon. For our purposes the decision horizon is the time when the NOI is expected to recover sufficiently to pay the debt6. Having addressed the borrower's willingness to pay, we now need to look at his ability. One source of external funds is his current liquid wealth7 which is comprised of his liquid personal assets, retained earnings from the property, and any loans he can get against his illiquid assets, e.g., second mortgages on his homes or other properties. Estimation of this value can be based on his personal financial statements (if available) with e.g., an 80% multiplier on their liquid assets and a 40% multiplier on their illiquid assets. Properly, the estimated wealth should be conditional on the default event, i.e., what is their wealth in a situation where there is a low DSCR. 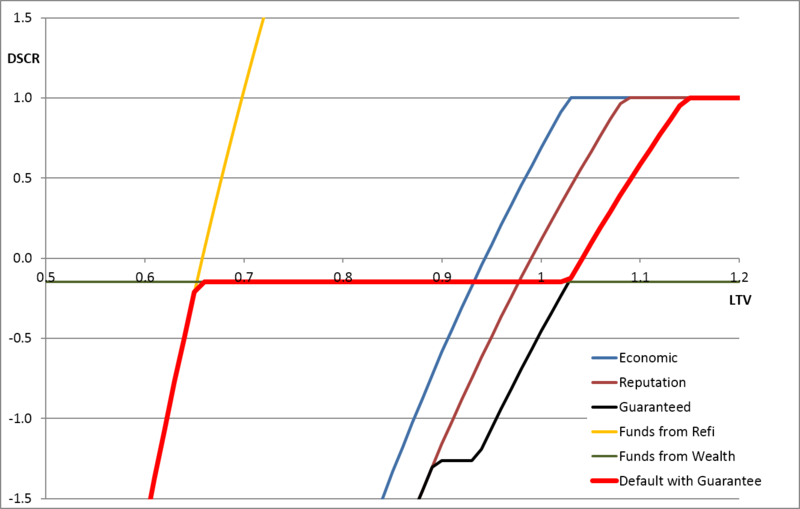 The indifference curves across the LTV/DSCR space for this base-case are shown in the following graph. 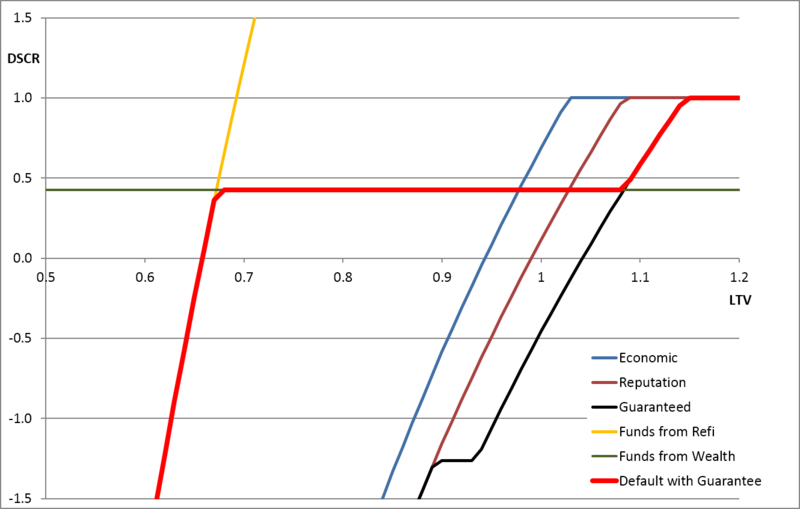 The blue, brown and black lines show the combinations of DSCR and LTV at which the borrower would be indifferent as to whether they defaulted. To the right of each line the LTV is so poor that the borrower would be willing to give the property to the bank. To the left of each line the borrower would be willing to pay to keep the property. The blue line assumes there is no guarantee ( ) and no value to reputation ( ) and could therefore be considered the indifference line for willing an "economic" default. The brown line assumes that the value of reputation ( ) is 5% of debt, and therefore the borrower is willing to maintain the loan at worse levels of LTV, i.e., the line moves right. The black line assumes that in addition to valuing reputation, the customer has given a guarantee and expects to pay up to 5% of the debt outstanding after a default. This pushes the willingness line further right. However, for better levels of LTV, the guarantee makes no difference because the property value is sufficient to pay off the debt without calling on the guarantee, so the black and brown lines converge for lower LTVs. 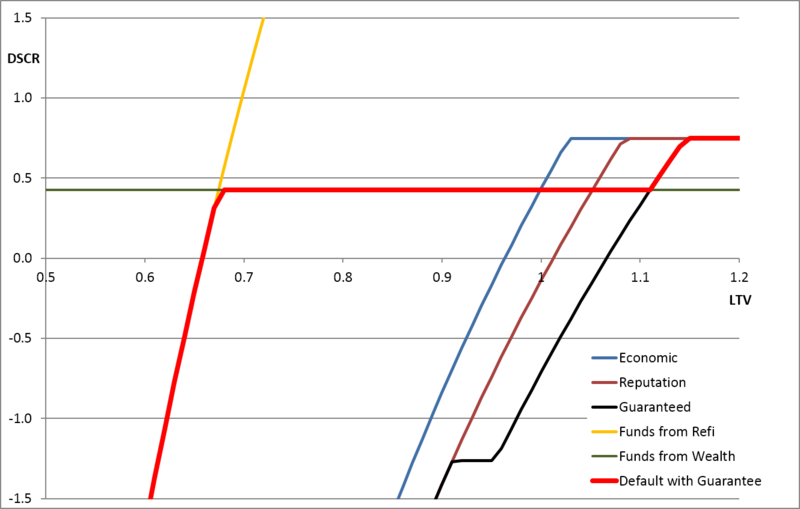 The green line represents the liquid funds ( ) that the borrower has available and therefore represents their ability to pay any shortfall from their own funds. 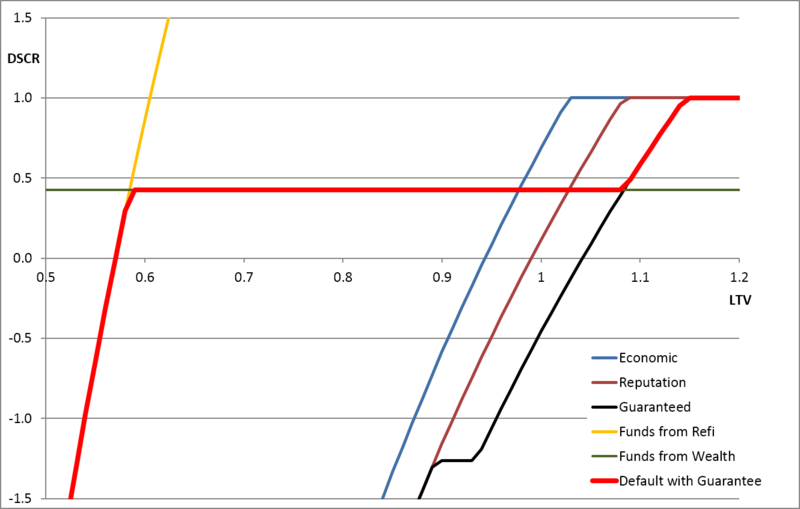 The yellow line shows the LTV/DSCR combination at which another investor or bank would be interested in providing funds, thereby making the borrower able to make payments to avoid foreclosure. The red line is the combination of the customer being both willing and able to make payments and therefore defines the boundary for default. Below 70% the loan is saved by refinancing. Between 70% and 90% LTV it is the borrower's ability to pay that is important, because they are always willing to pay. Above 95% LTV, the borrower is unwilling to pay if only economics are important (e.g., in a CMBS), but the cost of reputation and personal guarantees (e.g., for bank customers) can stretch the willingness up to 105% or 115% LTV. Clearly many of these parameters are difficult to quantify for individual borrowers and situations, but most of the parameters are implicitly valued by lending and credit officers in making their decisions. Some factors such as the accessible wealth ( ) can be based on evidence like personal financial statements, other factors such as the decision horizon ( ) can be estimated by simulating market conditions and projecting the future possibilities for NOI. The charts below show the effect of varying individual parameters. Each graph shows the effect of varying one parameter. The key result in each case is the red default-line. The most important movement of the line is caused by changes in the borrower's ability to pay from their own funds ( ) relative to the expected length of time ( ) that the shortfall is expected to occur. The other factors certainly make a difference to the results, but the structure of the model is reasonably robust and the other parameters would need to be shifted to unreasonable levels to make a large difference to the form of the results. In each circumstance these elements may be evaluated in absolute terms to assess the willingness to default. Also note that this default decision is made at the time and situation when a payment is due, rather than, for example, looking at the probability of default based on LTV and DSCR a year previously. It shows the structure of the problem and the relationship between the key elements to be considered. It guides the shape of the default boundary when projected onto the DSCR/LTV plane. It shows the credible ranges for default decisions, e.g., under certain circumstances it is perfectly possible for a deal to not default when it has an LTV of 110% and a DSCR of -20% (e.g., with expenses but no income). 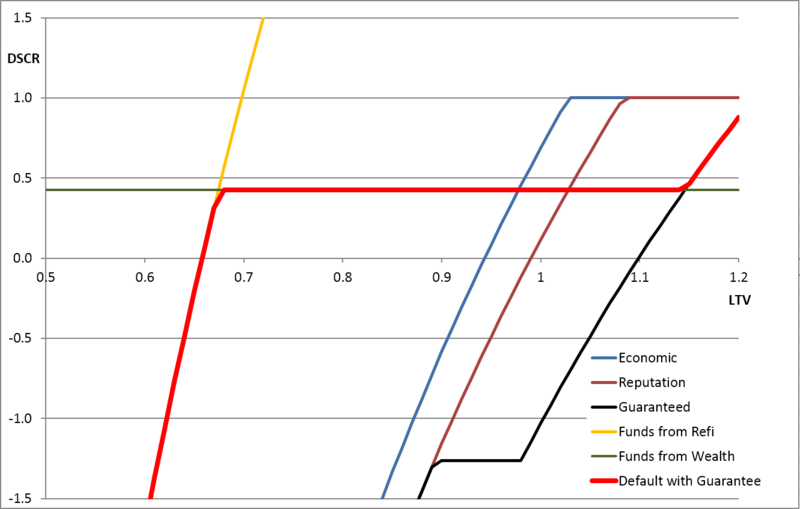 Returning to our original point about reducing the fuzziness (or probabilistic uncertainty) around using LTV and DSCR for estimating defaults, what this analysis shows is that some of the fuzziness comes from failing to include factors such as , , and in the analysis, and another source of the fuzziness is that the dimension of DSCR is too simplistic and is a distortion of actual default logic. The main usefulness of this analysis is to give a single integrated framework for assessing debt servicing, collateral value, reserve accounts, customer's worth, reputation and guarantees.